"Landmark Eatery Serves Up Tasty Summer Fare"
The Red Rabbit Drive-In along Route 322 near Duncannon sits dormant for much of the week like a relic when Elvis Presley and Buddy Holly tunes blared from car radios from inside Chevrolet 409s. Come Friday, however, the small parking lot surrounding the iconic restaurant often is packed with vehicles, as carhops carry trays full of Bunny Burgers and hand-spun milkshakes to hang from driver-side windows. Sammy Berger, grandson of the original owners, is poised to take over the business which has been a local gathering spot since 1964. Berger said his grandfather, Sam Snyder, worked at a Harrisburg area restaurant and drive-in for years. While traveling from his home near Amity Hall, he'd often pass a vacant restaurant. "Every day, when he drove to work, he'd go past this location," Berger said, sitting at one of Red Rabbit's picnic tables. "Eventually, he decided to open a location up here." Before opening, however, Snyder wanted to make sure the restaurant would be profitable. "My grandmother remembered sitting in the parking lot as he counted the cars going past." Snyder and his wife, Maggie, opened for business on Mother's Day in '64, serving many of the items still on the menu today. In 1988, the Snyders retired and passed the business on to their son-in-law and daughter, Sam and Cindy Berger, who still own the restaurant. Though Berger admits some dishes, including the renowned fried pies, have gone by the wayside, many favorite items have endured for a half-century. Berger believes the guarantee that patrons will be munching on the same popular items from decades past keeps them hopping back. 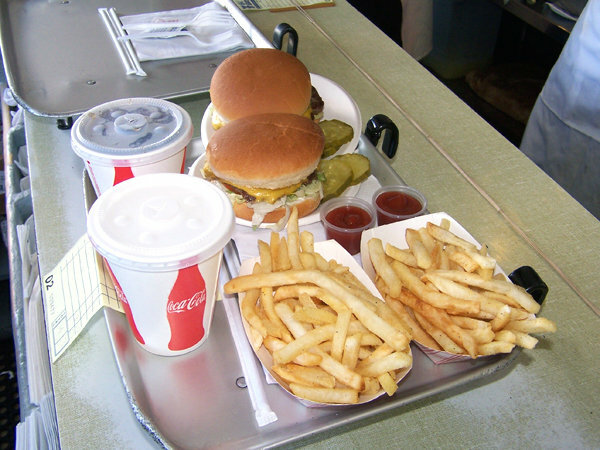 Ham and pork barbecue sandwiches, french fries with Bunny Dust and hand-spun milkshakes are among Berger's favorite summertime eats, but, in his opinion, the restaurant's fish sandwiches with homemade tartar sauce and Bunny Burgers are best. "I love the fish sandwiches. I have one every day we're open. As far as I know, my grandfather was a big fan of the fish sandwiches, too." The restaurant mascot -- a rabbit with big red, circular cheeks and a checkered chef's hat -- is easily recognizable. 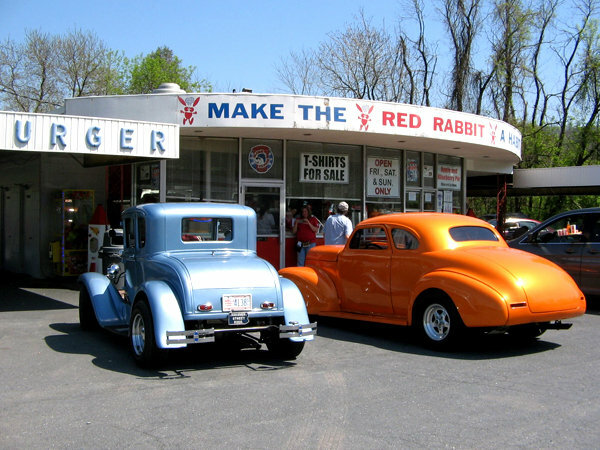 Berger said the restaurant's name and slogan -- "Make the Red Rabbit a Habit" -- were thought up by his grandparents. "They said it's just something they came up with." And, for decades, customers have regularly visited the Rabbit to satiate a habit often passed on to their children. "We are now getting generations of people coming in," Berger said. "When I'm out I'll tell people I'm from the Red Rabbit, and they'll say, 'Oh yeah, that place is great.'" Ambience is part of the Red Rabbit experience. "I would say it's just sitting around and eating your meal in your car," he said. "There aren't too many drive-ins around anymore." Those looking to take their first bite of a Bunny Burger or repeat customers headed for their Red Rabbit fix can visit the restaurant 11 a.m. to 9 p.m. on Fridays, Saturdays and Sundays from the first weekend in February until the weekend before Thanksgiving. Copyright © 2014 Pennlive.com. All rights reserved.